The term “Triple Crown” was coined by sportswriter Charles Hatton while covering the 1930 victories of Gallant Fox in the Kentucky Derby, Preakness Stakes and Belmont Stakes. Before then, only Sir Barton (1919) had won all three races in the same year. Since then, thirteen horses have won the Triple Crown. Three trainers, James (Sunny Jim) Fitzsimmons, Ben A. Jones and Bob Baffert, have saddled two Triple Crown champions, while Eddie Arcaro is the only jockey to ride two champions. 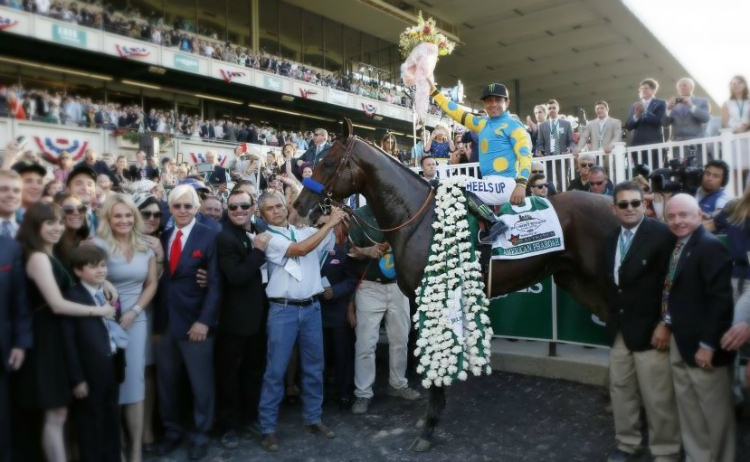 Triple Crown immortality is horse racing's greatest honor. Countless horses have tried and only 13 have succeeded. American Pharoah, the 12th Triple Crown winner. In 1919, Sir Barton was the first horse to claim the Triple Crown, capturing the Kentucky Derby, Preakness Stakes and Belmont Stakes in the same year. Gallant Fox (1930), Omaha (1935), War Admiral (1937), Whirlaway (1941), Count Fleet (1943), Assault (1946), Citation (1948), Secretariat (1973), Seattle Slew (1977) and Affirmed (1978) have followed in infamy. In order to win a Triple Crown, a horse must win three long races in five weeks, at three different tracks, in three different states. Triple Crown hopefuls must first win the Kentucky Derby, where Aristedes grabbed the inaugural "Run for the Roses" in 1875. Barring injury, the Derby winner is shipped to the second jewel of the Triple Crown, the Preakness Stakes. Survivor was the first Preakness winner in 1873. A Derby-Preakness champ then has a shot at Triple Crown immortality at the Belmont Stakes. The first Belmont winner was Ruthless in 1867. There have been 17 horses that have won the first two jewels of the Triple Crown and failed to win at the Belmont. Two of them, Burgoo King in 1932 and Bold Venture in 1936, didn't run in New York. Each of the past three years, horses have traveled to Belmont with Triple Crown hopes. Silver Charm and Real Quiet finished second in 1997 and 1998, respectively, while Charismatic placed third last year. The Triple Crown is without a doubt the most demanding accomplishment in all of Thoroughbred racing. A horse must first capture the Kentucky Derby at Churchill Downs, then win the Preakness Stakes at Pimlico, and, finally, earn victory in the Belmont Stakes at Belmont Park. All successive victories in the three Triple Crown races are run during a span of only five weeks from May to June at three completely different distances (1 1/4 miles, 1 3/16 miles and 1 1/2 miles). The world's best 3-year-olds are given the definitive test of speed, stamina, and conditioning. Only 12 colts have possessed both the racing fortune and complete physical package necessary to capture the Triple Crown. Forty-four other horses have finished just one win shy of the prestigious honor.